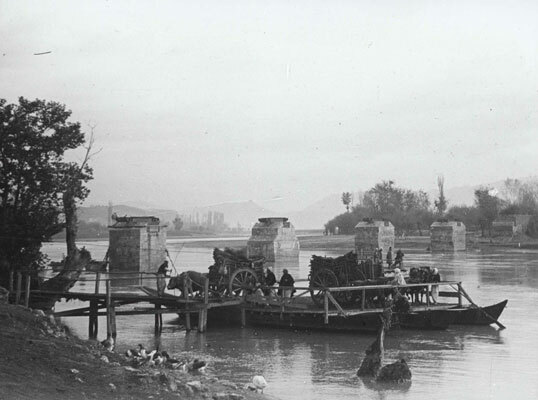 Ferry at Bahçallëk near Shkodra, 1914 (Photo: Hendrik Reimers). The Conference of London, or Conference of the Ambassadors as it is often known in Albanian history, was a gathering of the six Great Powers (Great Britain, France, Germany, Austria-Hungary, Russia and Italy) to resolve certain problems in the Balkans which had arisen as a result of the collapse of the Ottoman Empire. It began its work on 17 December 1912 under the direction of the British foreign secretary, Sir Edward Grey (1862-1933), following the first Balkan War and the declaration of Albanian independence in Vlora on 28 November 1912. On 30 May 1913 an agreement was reached under which Turkey would give up all territory west of the Enos-Midia line. Albania is constituted as an autonomous, sovereign and hereditary principality by right of primogeniture, guaranteed by the six Powers. The sovereign will be designated by the six Powers. Any form of suzerainty between Turkey and Albania is excluded. Albania is neutral; its neutrality is guaranteed by the six Powers. The control of the civil administration and finances of Albania is to be given over to an International Commission composed of the delegates of the six Powers and one delegate from Albania. The powers of this commission will last for ten years and may be extended if necessary. The commission will be charged with preparing a draft for the detailed organisation of all branches of the administration of Albania. Within six months, it will present to the Powers a report on the results of its work and its decisions on the administrative and financial organization of the country. The sovereign is to be nominated within six months. Until his designation and until the formation of a definitive national government, the activities of the existing local authorities and the gendarmerie will be controlled by the International Commission. Public order and security will be assured by the international organisation of a gendarmerie. This organisation will be in the hands of foreign officers who will exercise effective command in the gendarmerie. These officers will be selected from the Swedish army. The mission of the foreign officers and instructors will not interfere with the unity of service, or with the employment of native commissioned and non-commissioned officers and gendarmes. The salaries of these officers may be ensured from the revenue of the country as guaranteed by the Powers.